We have mostly been harvesting, and moving water around. We did get to planting more asparagus and seeding some late season crops such as spinach and radishes. With any luck the spinach and radishes will be ready late September for the last veggie box. The asparagus takes at least three years to start producing. We also moved the older cows back to our property to get more graze, which means there has been a lot of mooing going on as the youngest three are still across the fence at our neighbors. Things should quiet down in a day or two as they all get used to the new situation and before long they will be reunited again as one happy herd. Salad mix, red cabbage, cucumber, zucchini, spearmint ….. 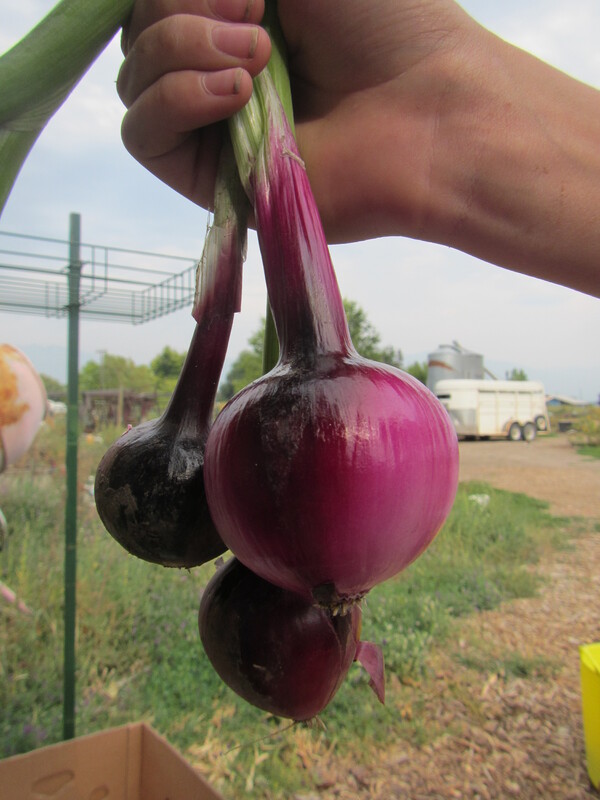 These red onions have a few layers of red and white on the inside, so be careful you do not peel them back too much so you can retain some of the fantastic color. These onions are still uncured, so best used within the week. The delicate flavor, soft shell and creamy white flesh of summer squash is a perfect addition to any summer meal. Summer squashes, members of the Cucurbitaceae family and relatives of both the melon and the cucumber, come in many different varieties. 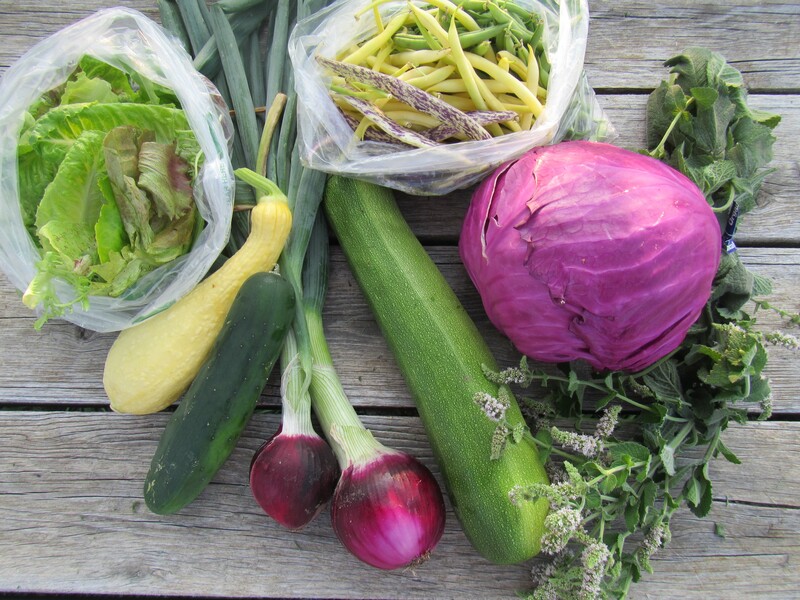 While each variety may have a distinct shape, color, size and flavor, all varieties share some common characteristics. Regardless of variety, all parts of summer squash are edible, including the flesh, seeds and skin. Some varieties of squash also produce edible flowers. 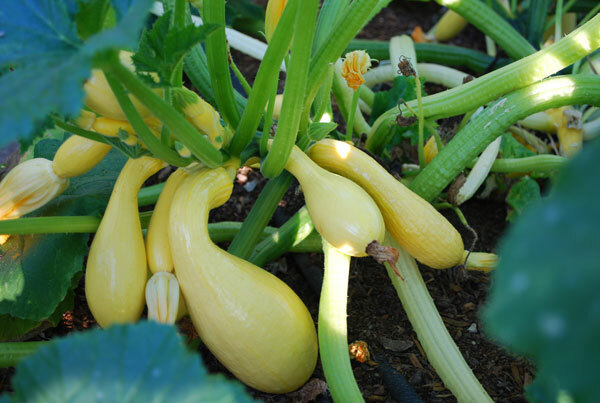 Unlike winter squash, summer squash are more fragile and cannot be stored for long periods of time unless frozen. Summer squash is very fragile and should be handled with care as small punctures will lead to decay. It should be stored unwashed in an air-tight container in the refrigerator, where it will keep for about seven days. 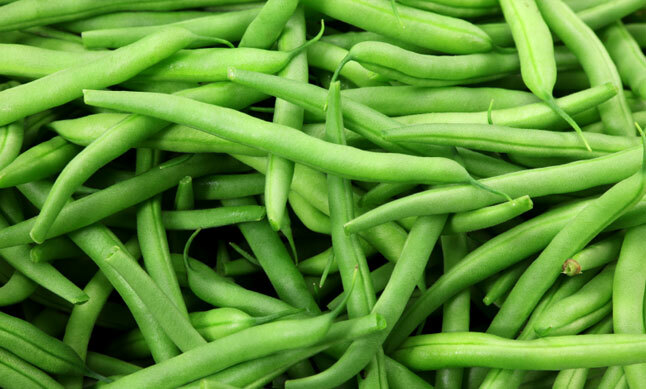 Similar to green beans. The variety we grow is an heirloom. 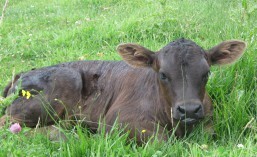 There are just a few of these in your veggie box, there will be more next week. 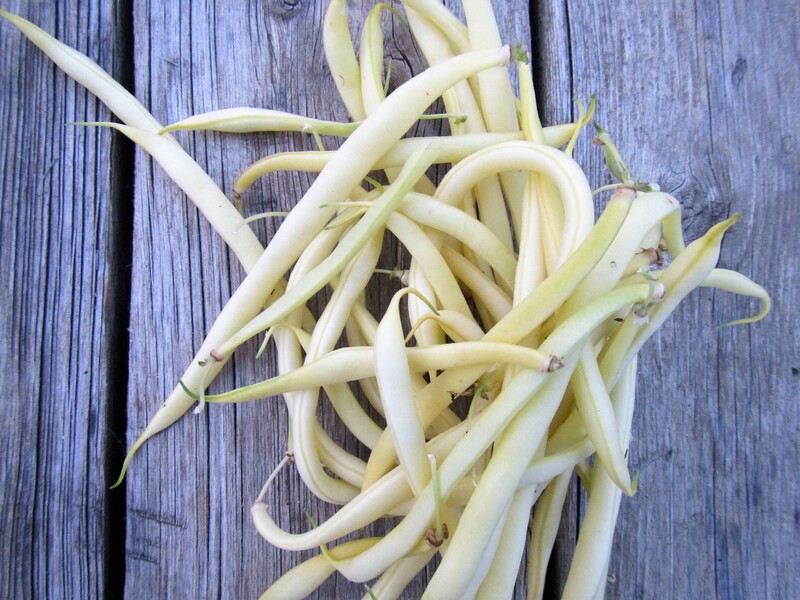 Cook them as you would the other beans, or try them raw, they are delicious and crisp. 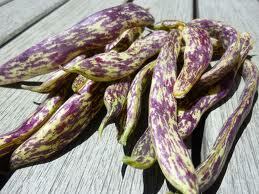 For more info on Dragon tongue beans click here. Wondering what to do with that large zucchini we put in your box? Make dough: Whisk together the flour and salt in a large bowl. Sprinkle bits of butter over dough and using a pastry blender, cut it in until the mixture resembles coarse meal, with the biggest pieces of butter the size of tiny peas. In a small bowl, whisk together the sour cream, lemon juice and water and add this to the butter-flour mixture. With your fingertips or a wooden spoon, mix in the liquid until large lumps form. Pat the lumps into a ball; do not overwork the dough. Cover with plastic wrap and refrigerate for 1 hour. Make filling: Spread the zucchini out over several layers of paper towels. Sprinkle with 1/2 teaspoon salt and let drain for 30 minutes; gently blot the tops of the zucchini dry with paper towels before using. In a small bowl, whisk the olive oil and the garlic together; set aside. In a separate bowl, mix the ricotta, Parmesan, mozzarella, and 1 teaspoon of the garlicky olive oil together and season with salt and pepper to taste. Prepare galette: Preheat oven to 400 degrees. On a floured work surface, roll the dough out into a 12-inch round. Transfer to an ungreased baking sheet (though if you line it with parchment paper, it will be easier to transfer it to a plate later). Spread the ricotta mixture evenly over the bottom of the galette dough, leaving a 2-inch border. Shingle the zucchini attractively on top of the ricotta in concentric circles, starting at the outside edge. Drizzle the remaining tablespoon of the garlic and olive oil mixture evenly over the zucchini. Fold the border over the filling, pleating the edge to make it fit. The center will be open. Brush crust with egg yolk glaze. Bake the galette until the cheese is puffed, the zucchini is slightly wilted and the galette is golden brown, 30 to 40 minutes. Remove from the oven, sprinkle with basil, let stand for 5 minutes, then slide the galette onto a serving plate. Cut into wedges and serve hot, warm or at room temperature. If you’ve got an adjustable blade slider, time to make it earn its keep! Very thinly slice half your fennel bulb, your celery and your half onion. If you don’t have a fancy slicer, just slice them thinly with a knife. Toss the fennel with lemon juice to prevent browning and also because it makes it extra delicious. In a small bowl, whisk together the vinegar, water, salt and sugar together. Add the onions and set them aside for about an hour. If you don’t have an hour, 30 minutes will still pickle them to deliciousness but they will only get better with age. Heat a small heavy skillet to medium heat and add one teaspoon olive oil. Add almonds and toss until lightly browned, 2 to 3 minutes. Season lightly with salt and pepper to taste. Transfer almonds to a plate, let cool, and cut each almond into half or thirds. Assemble your salad: Toss green beans with most of fennel, all of celery and half of the pickled red onions. Sprinkle two tablespoons of the red onion pickling liquid and two tablespoons of olive oil over the mixture. Season generously with salt and pepper. Taste, adjust seasonings and ingredient levels to your preferences — we found we wanted more fennel, red onion and pickling liquid. Serve, then eat, eat, eat.